Chances are good that when you dream about your home's ideal exterior, you aren't automatically thinking about lighting. 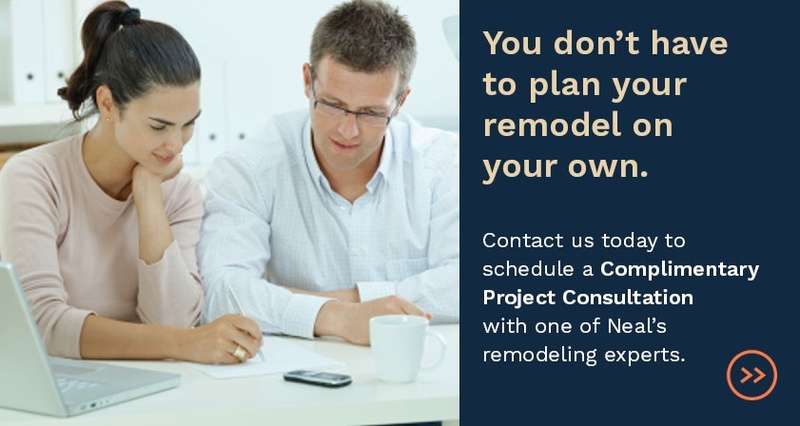 It's not the most glamorous aspect, especially next to new landscaping and beautiful outdoor living spaces. When the sun goes down, however, without lighting on the outside of your home, all those wonderful exterior spaces (and all that effort to improve them) are lost to the darkness. 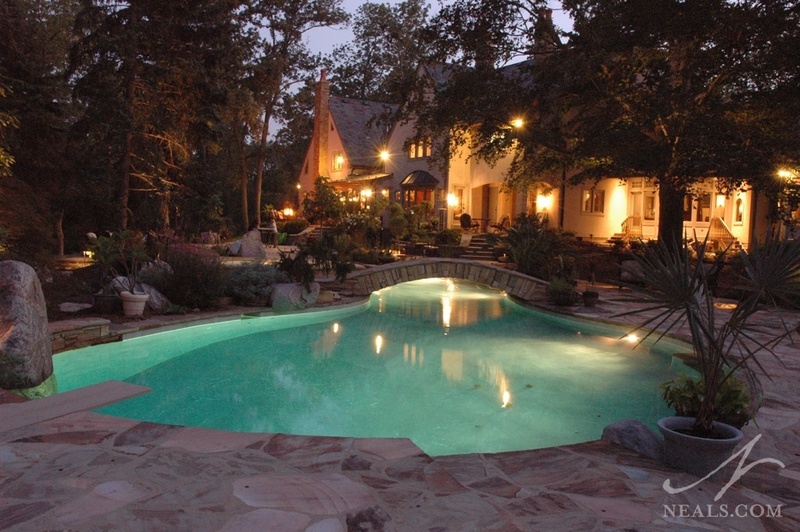 Lighting on the back of the house and in plantings around the pool create a pleasant atmosphere in this backyard in the evening hours. Lighting your exterior spaces is just as important as lighting a kitchen or bathroom. It's important to think of visibility in all areas of your outdoor space. If an area is too dark, it won't be as functional for you as it could be. Alternatively, if you have provided the wrong type of light in an area, you may find that the evening ambiance isn't what you always dreamed of. Exterior lighting schemes should strike the balance between making a space bright enough to be useful and safe, and dim enough to enjoy the evening outside. In this backyard remodel, decorative lights were added inside the structure while utility lights outside help illuminate pathways. You won't need a lamp at your bonfire pit, but what about the path to the pit? A few well-spaced tiki-style torches can light the way and blend in with the surroundings. If you want to have a late-night barbecue, you'll need more than a sconce or two nearby to ensure the grill area is safe. Remember that your outdoor fireplace will provide plenty of warmth, but not enough light for some twilight reading. Pool lighting can act as a safety feature to prevent someone from accidentally falling in, while also providing a large filtered light over a large area. 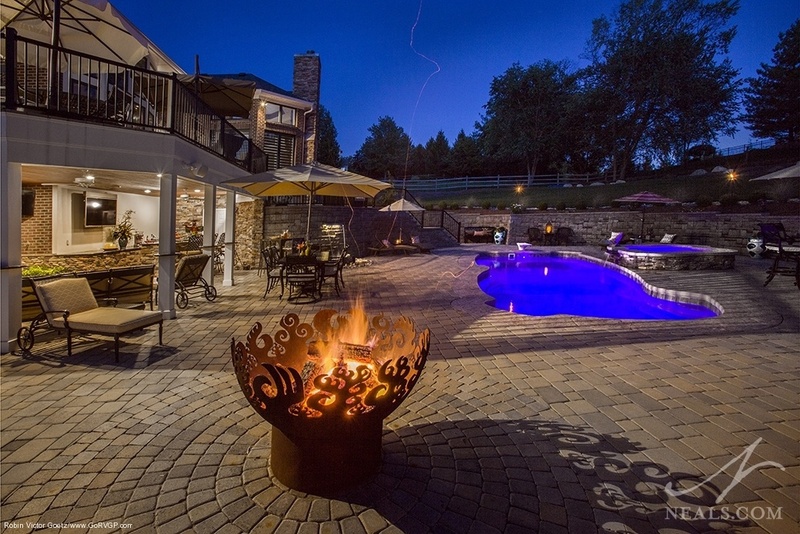 A gas fire ring, fun pool lighting, and tiki-torch lanterns around this patio create an exciting environment for late-night pool parties. Lights spaced throughout plantings mean that the colors and variety of your landscaping can still be enjoyed after sun-down. 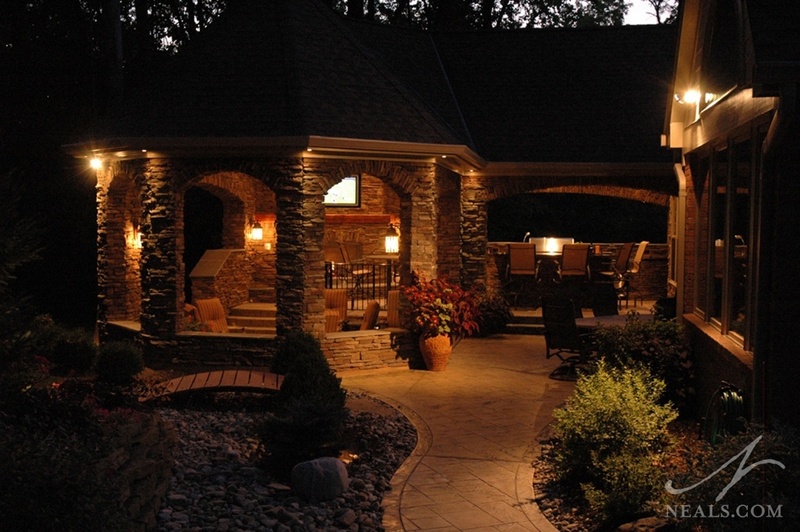 Motion-sensor lighting on the outskirts of your outdoor living spaces can help with security. They can also help guests find their way, but not detract from the atmosphere in the main areas. Lights in or near steps prevent injuries as well. A portable lantern placed on a step is a stylish way to make sure your footing is right. 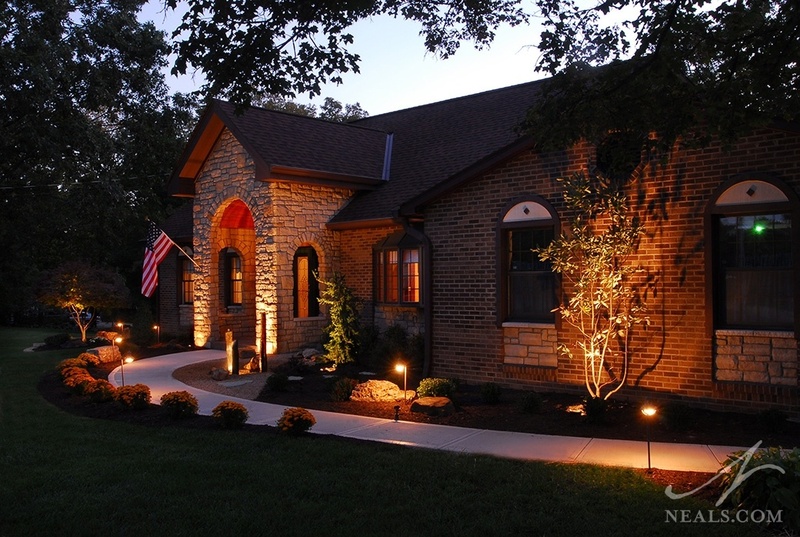 Lights along the walkway to the front door make this home inviting and safe. There are many exterior lighting products available, and even interior lights can be configured to work in outdoor spaces, such as a statement-making chandelier hanging in the center of a gazebo. Solar lights along paths are an easy and cost-effective addition. Great lighting in your exterior space can act like evening jewelry, and ensure that you can enjoy your space any time, day or night.